Leawood is a part of the Kansas City Metropolitan Area and is a suburb of Kansas City. Leawood is located in Johnson County, Kansas. The population of Leawood according to the 2010 census was around 32,000 residents. The city of Leawood was named for the principal landowner who purchased about 600 acres of land originally, his name was Oscar G. Lee. 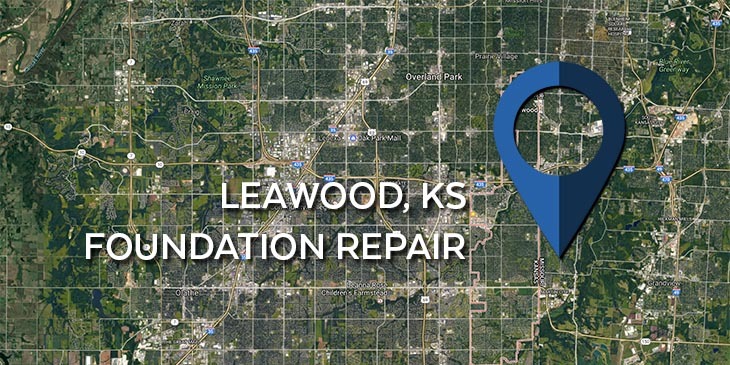 For those who reside in the area, KC Pro proudly offers foundation repair in Leawood KS and for surrounding areas to ensure a safe living environment. We are a full foundation repair company. We are your premium service provider for basement waterproofing, concrete repair and installation, mudjacking, and foundation repair. When your home needs to be fixed, we provide you with quality work that is done quickly but holds permanently. Details matter with your home because it is what keeps you safe from storms and keeps a roof over your head for shelter so it needs to be sturdy. KC Pro proudly provides foundation repair Leawood KS and for the surrounding areas for your home. If you find that your home has foundation problems such as cracks, leaning walls or chimneys, or a sinking foundation, then you need to have a professional take care of the issue. Your foundation issues can be solved by KC Pro so that your home can continue being safe and sound for everyone. We only use the best foundation repair products in the industry. All that we use is provided by the Earth Contact Products. ECP is widely known as the leading manufacturer of foundation repair products. Their galvanized steel, helical and push piers are the best at relieving foundation stress and providing structural support. Unfortunately foundation damage and basement water leakage often come hand in hand. If there are cracks in your basement walls or foundation you can be certain that moisture will find its way into your home, bringing with it mold growth, wood rot, and possible belonging damage. You’ll want a qualified and reliable waterproofing contractor to insure the safety and comfort of you and your family. Since KC Pro is a full foundation repair company, we also take care of basement waterproofing Leawood KS. You do not have to worry every time there are heavy rains coming. We can install exterior and interior waterproofing in your home so that the flooding in your basement can cease to exist. We want to help in any way we can, so have us come in and take care of your basement waterproofing Leawood KS problems. If you are in need of foundation repair Leawood KS or in any of the surrounding areas, then contact us today at KC Pro.